This is really just a quick hello, so I could share these amazing muffins with you guys. 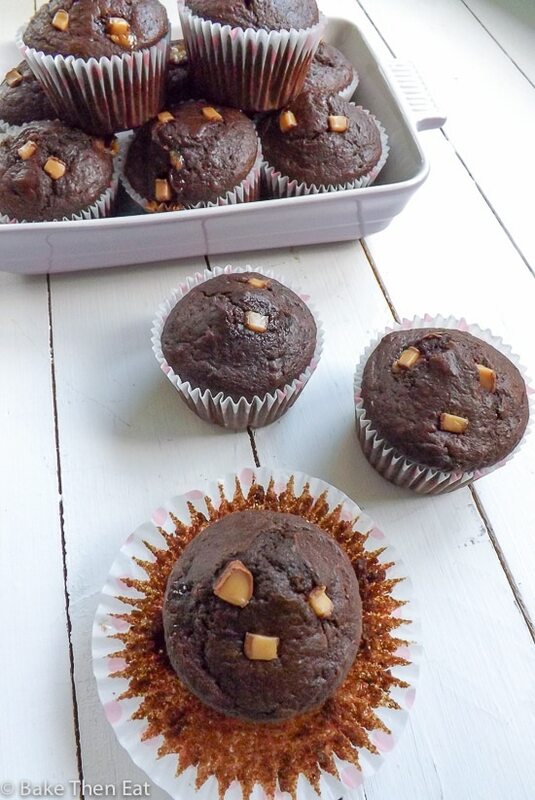 I have come to realise that I am ever so slightly obsessed with breakfast foods, especially slightly naughty ones and these Fudge Studded Mocha Muffins fit that bill perfectly. As time is short on the home front at the moment due to far to may things to go into here, we shall crack on with these fudge studded mocha muffins right away. One of my guilty pleasures when visiting a coffee shop is a mocha. I love the combination of coffee and chocolate together they really are great partners, rich and indulgent with a cheeky little kick. 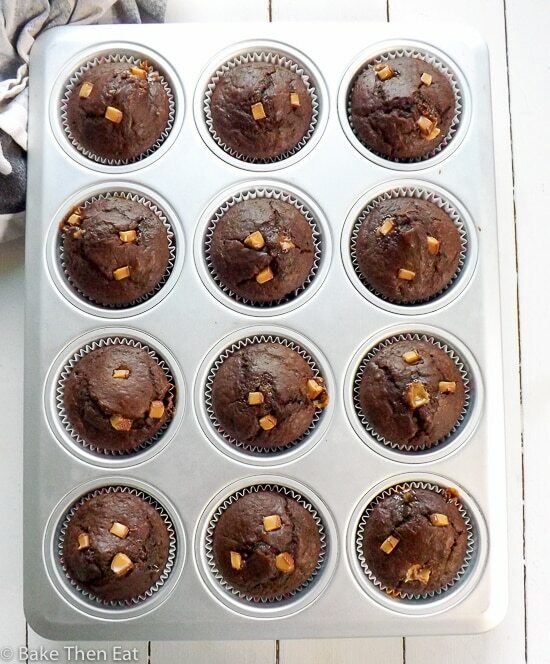 When I made these muffins I wanted to make sure that I didn’t loose that coffee undertone and after a few misses I eventually got the amount just right. 5 tablespoons of instant coffee dissolved into 2 tablespoons of boiling water. This gives that perfect coffee balance next to the chocolate flavour. Fresh coffee just won’t be strong enough for this recipe and neither will espresso. You would need to use so much fresh coffee or espresso to get a good coffee flavour that it would cause all sorts of problems for the batter, making it far too wet to bake. 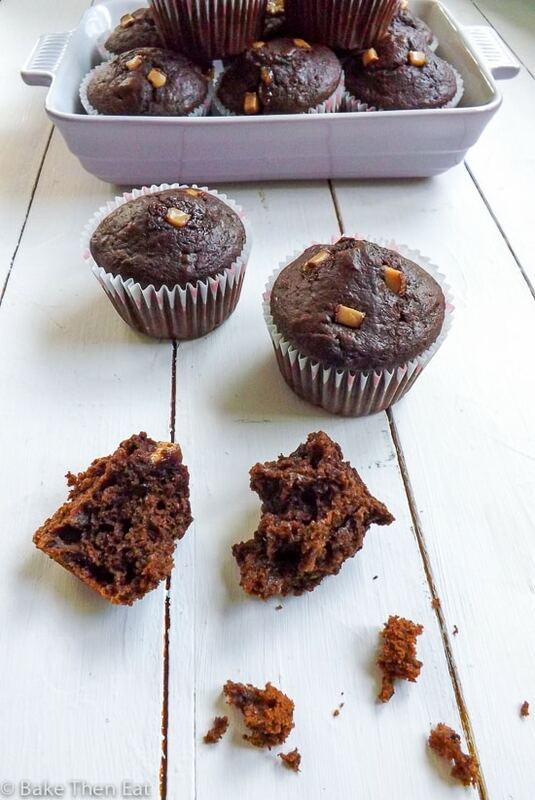 Whereas instant coffee gives us the flavour punch we need for these fudge studded mocha muffins and it doesn’t add too much liquid for the batter to be able to bake up properly. I have use unsweetened cocoa powder for the chocolate flavouring. 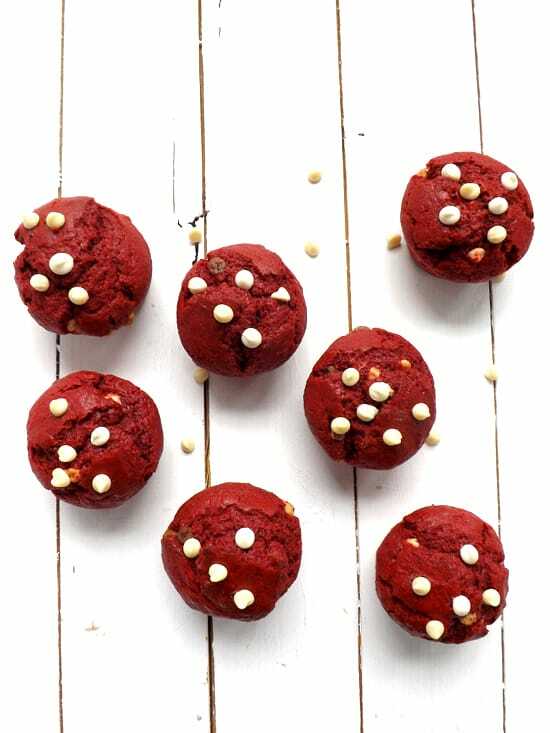 It gives the deepest chocolate flavour without adding any liquid to the batter. I find melted chocolate great in brownies but not so great in muffins as we are back to that ‘too much liquid in the batter’ problem. So cocoa powder is the go to chocolate of choice this time. Also lets not forget there is chocolate on the fudge chunks as well. For the fudge pieces I just chopped up 4 cadburys finger of fudges into little chunks, there was no other reason for adding them then I really wanted to because I love fudge and it goes really well with both chocolate and coffee, so why not? Also these fudge studded mocha muffins are even better on day 2. 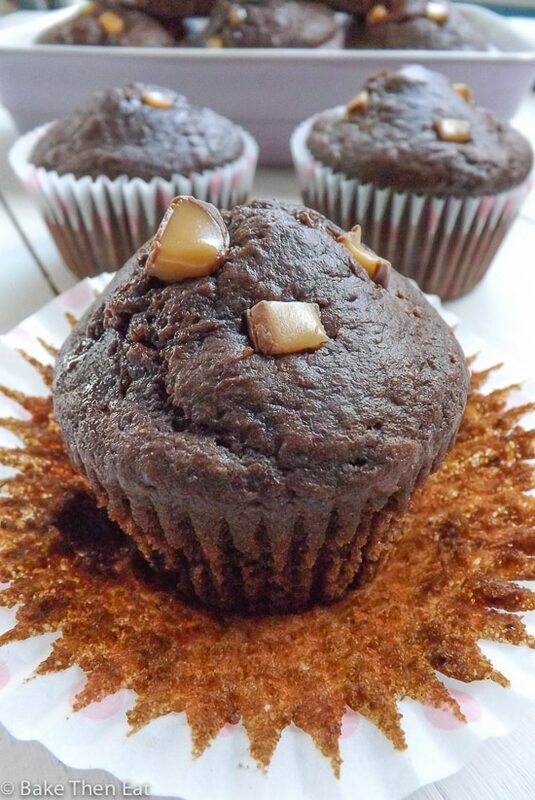 Which is highly unusual for muffins but the flavours mature and become even better they also remain soft and moist. So what’s stopping you from getting you mocha on? 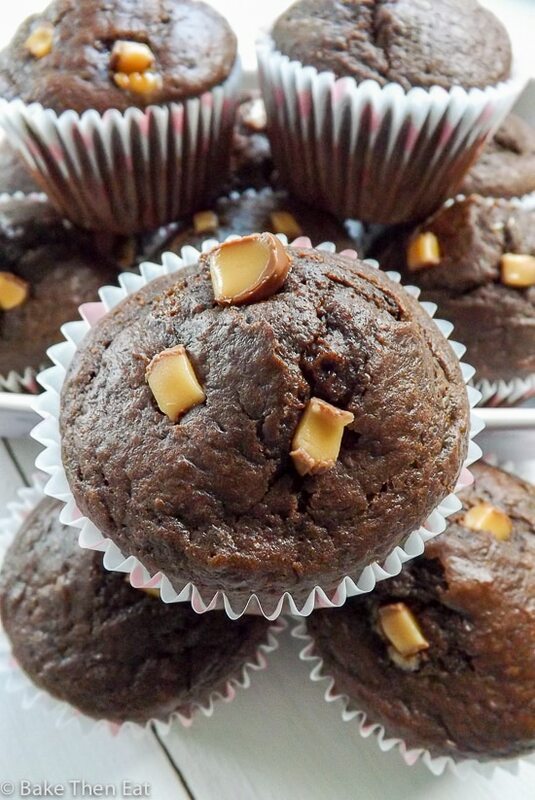 Fudge Studded Mocha Muffins make a wonderful breakfast treat. 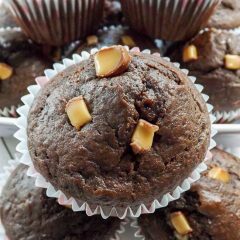 A chocolate muffin with a hint of coffee in every bite and small fudge pieces studded throughout. Preheat your oven to 425F / 200C / Gas mark 7 and prep a 12 hole muffin pan by either lightly greasing it or using liners, then place it to one side. Chop the finger of fudges into small chunks and then separate them into two piles. In a medium sized bowl mix the flour, cocoa powder salt, baking powder and baking soda together until well combined. Place the coffee in a medium to large heat proof jug and add in the boiling water to dissolve it. Once the coffee is dissolved add in the applesauce, dark brown sugar, Greek yogurt, vegetable oil, vanilla extract and milk and whisk until everything is very well combined. Add in the eggs to the liquid ingredients and mix them in. Pour the wet ingredients into the bowl of dry and with a very gentle hand combine them. When the batter is almost fully incorporated add in half of the chopped up finger of fudges and give the batter one final stir. Spoon the batter into your prepared tin, then sprinkle the remaining pile of fudge pieces on the tops of the muffins and pop them in your hot oven. After 5 minutes turn the oven down to 375F / 190C / Gas mark 5 and bake for a further 12 to 15 minutes. Check on your muffins after 12 minutes at the lower temperature to see if they are done, if a pick doesn't come out clean then give them a further few minutes. Once baked through, take the tray out of the oven and leave the muffins to cool for a few minutes before transferring them to a wire rack to fully cool down. When kept in an airtight container at room temperature these muffins will keep well for up to 5 days, these muffins also freeze well for up to 3 months. Tried this recipe?Mention @BakeThenEat or tag #BakeThenEat! Share this recipeMention @BakeThenEat or tag #BakeThenEat! Breakfast is my favorite too and muffins are always a yummy way to start the day! Love the mocha! Thanks Liz, fingers of fudge are so good! How stunning these muffins have turn out. Chocolate and coffee go so well together. Love the addition of applesauce and greek yogurt. Good god woman! You’ve taken flavours I love and shoved them in my favourite kind of transportable cake! Thanks Emma 🙂 gotta love a muffin! 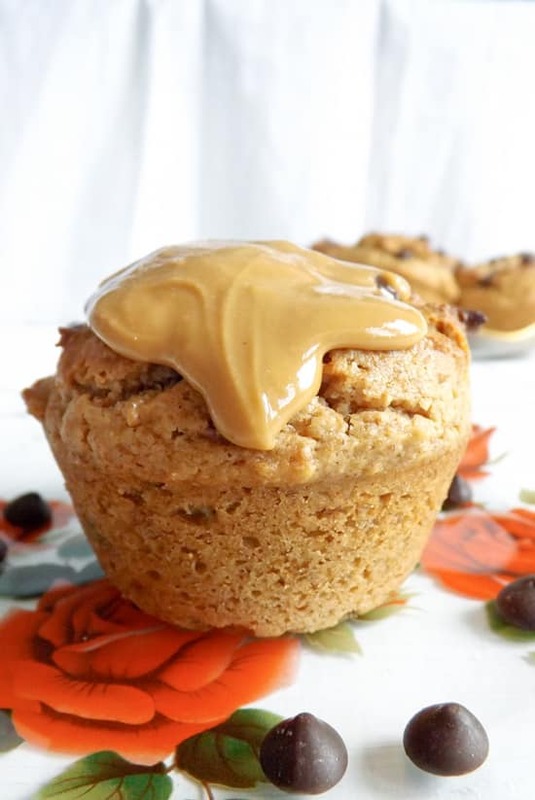 I love the idea of desserts for the breakfast..these muffins look awesome! Grab yourFREEcopy of Easy Healthy Recipes eBook and sign up for weekly recipes. Grab your FREE copy of Easy Healthy Recipes eBook and sign up for weekly recipes. All recipes are Vegetarian, many are Vegan & some are Gluten Free. Please check your emails for subscription information.